At a tiny shop in the old downtown of Tokyo, you can see an art form that almost died out—and eat it, too. 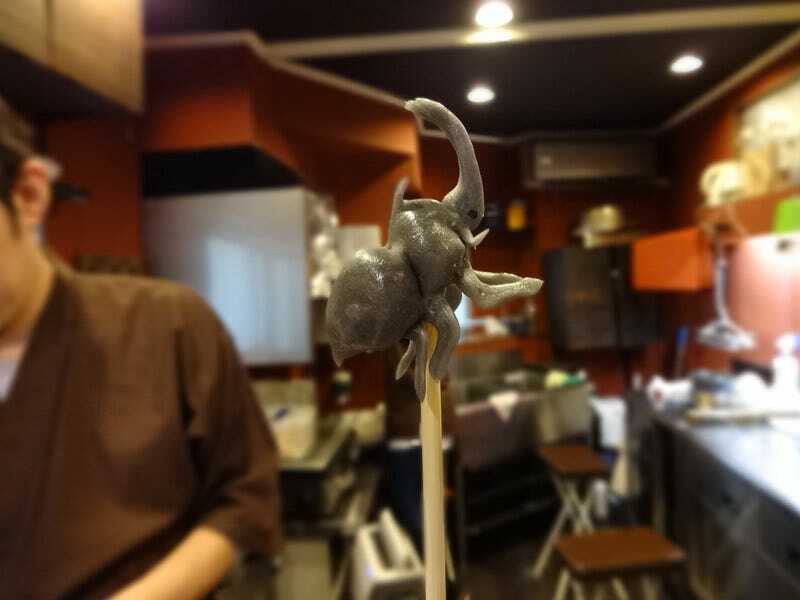 The craftspeople at Amezaiku Yoshihara make intricate candy creatures by hand as you watch, forming sugary starch into delicate legs, wings, and ears in just the couple of minutes before the candy hardens. Amezaiku was once a common street entertainment for children, but the traditional carts were outlawed in the late 20th century and until recently it could only be seen at festivals and special events. Amezaiki Yoshihara, which opened in 2008, was the first permanent shop devoted to this craft. Its owner apprenticed with a master for two years and worked by himself for four years before going into business. You can buy ready-made items, but for the full experience, customers pick a creature from their catalog and have it made on the spot. To start, the artisan grabs a glob of the hot white starch from the pot, adds a little coloring, kneads and stretches it like taffy, and puts it on a stick. Then, using just his fingers and a small pair of scissors, he quickly forms the details. The possibilities range from pretty birds to cute dogs to challenging forms like the rhinoceros beetle, an insect traditionally kept as a pet in Japan. The completed creature is left to cool completely and then packaged safely for carrying, since surely nobody could have the heart to eat it on the spot. Legend has it that amezaiku goes back to the 8th century and began as a temple offering, while other stories tell of ninjas disguising themselves as candy craftsman to steal methods and develop ever more intricate techniques. Through much of history the candy was hollow, blown by mouth like glass, until health regulations outlawed that method in the 1970s for hygienic reasons. Amezaiku Yoshihara has brought the craft into the 21st century in ways the ninjas couldn’t dream of, with a Facebook page, an online shop, and their own mascot: a white rabbit, offered in seasonal variations, dressed for holidays like Halloween or Christmas. And instead of just watching, now everyone gets to take photos and video of the process.